For doors 1-3/8? thick, weighing up to 125 pounds per door. Precision extruded commercial grade mill finish aluminum track. Patented "tricycle" hangers with 1" [25mm] dia. wheels ride smoothly and quietly on convex shaped rails with single point contact. 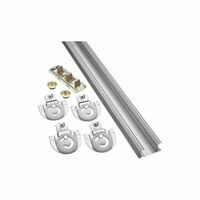 Hangers feature a quick disconnect clip system facilitating easy mounting or dismounting of door panels. Hangers are adjustable for height in case of settling. 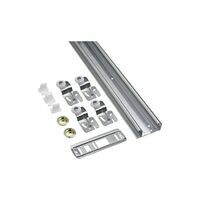 Set contents: (1) 138F track length, (4) 1120 hangers, (1) 2135 door guide, (1) 2155 door stop, (2) 30 satin nickel flush pulls, (1) 1712 adjustment wrench, and mounting screws.